Salvador Dali’s Factory is our second article on his often overlooked performance activity. see here our 2013 piee on occasion of Dali’s retrospective at Reina Sofía museum. 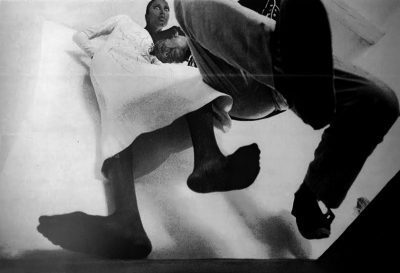 Scroll down at your own risk. 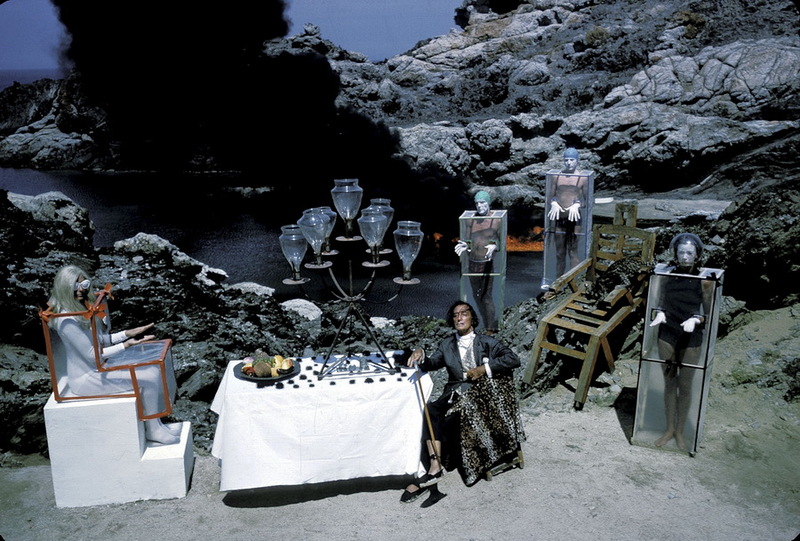 Dali’s home in Port Lligat, Hotel Meurice in Paris and St. Regis Hotel in New York, became the most desirable destinations for the emerging 60s and 70s youth new culture, as its host, Dalí would spend extended periods of time a year on each of these locations creating a de facto global “factory” he referred as “court of miracles”. 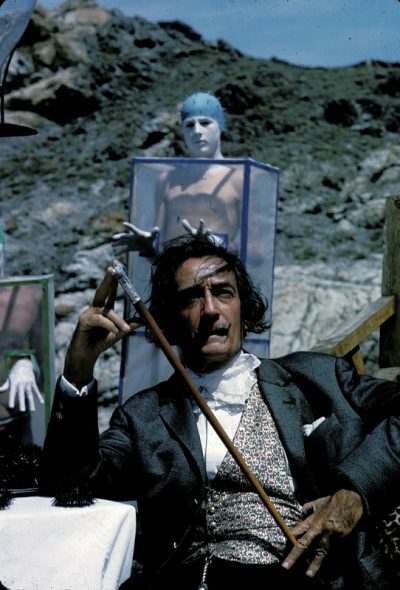 Dali would encouraged the indulgence of desire through performances and meetings/parties as a path towards discovering the Surrealist threshold of the sublime. 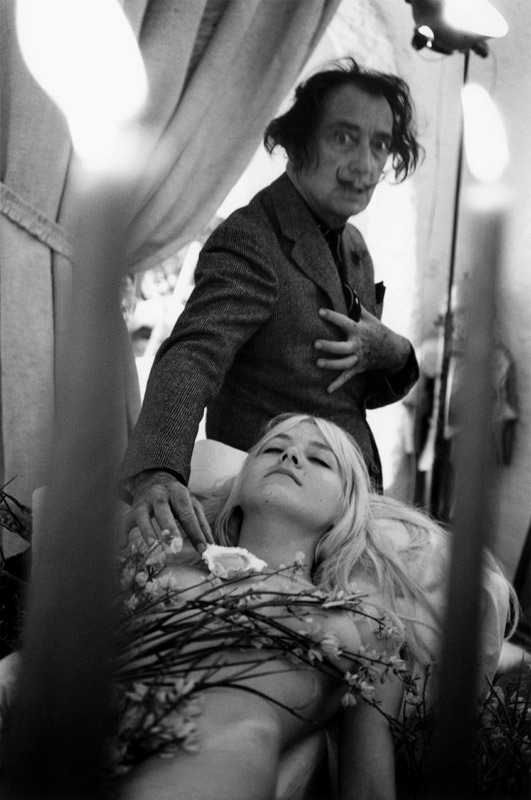 The Dionysian revelry that took place provided an intense backdrop for a new generation fascinated with all things mystic, alchemical, and anti conformist, finding an unprecedented father figure in the artist. 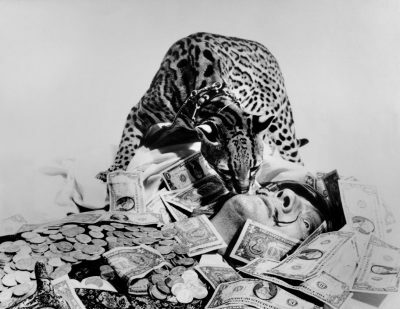 Dali’s most treasured pet was a tamed Colombian ocelot called Babou. 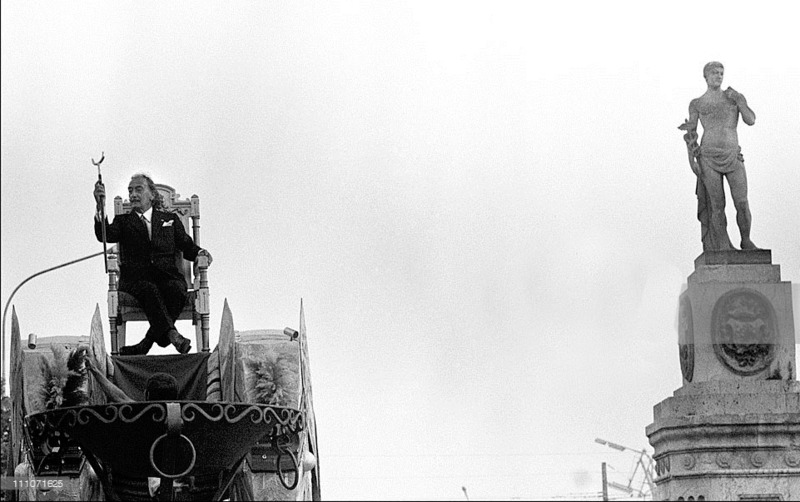 It accompanied him nearly everywhere he went. While in a restaurant in Manhattan a fellow diner became alarmed, he calmly told her that Babou was a normal cat that he had “painted over in an Op Art design”. 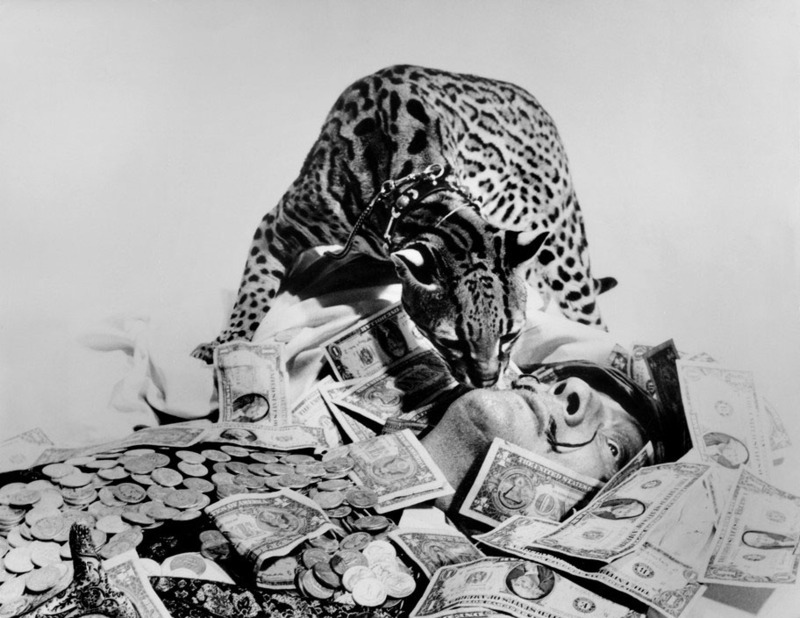 The Da Da Dalí project was an eight-day performance by Dalí, his wife Gala, his ocelot pet Babou and model Lotte Tarp. 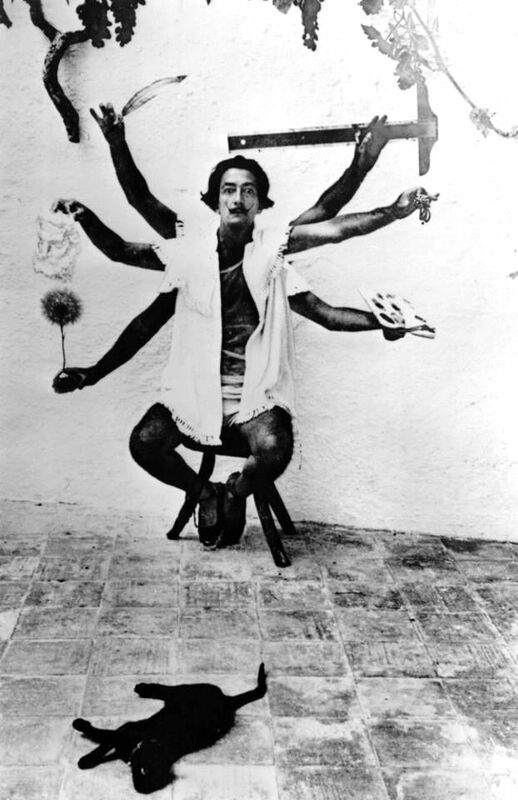 The photographs were made by Werner Bokelberg but most were later edited by Dalí and made into photo collages. 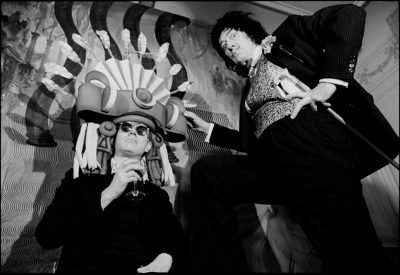 The project began in 1965 when Bokelberg and journalist Walther Hermann Schünemann went to see Dalí to portray him for Stern Magazine. 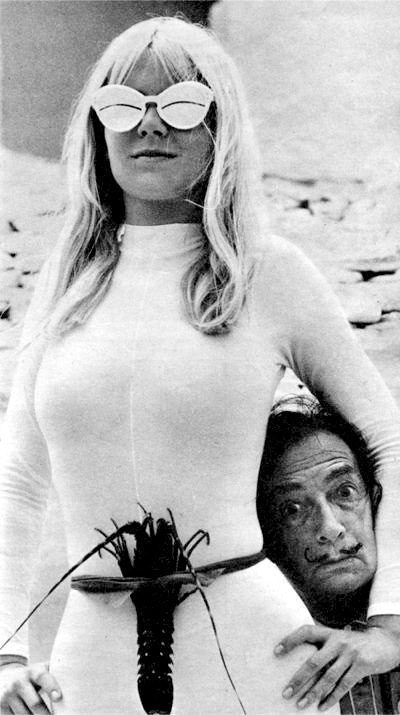 They met Dalí in Paris and were invited to visit his private house in Port Lligat on the Spanish Costa Brava, provided that they bring a blonde with them. 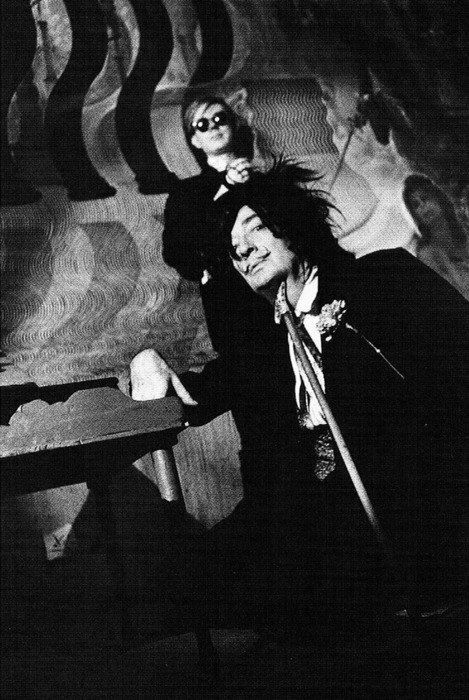 Accompanied by Lotte Tarp Bokelberg and Schünemann went to the maestro home in the spring of the following year. 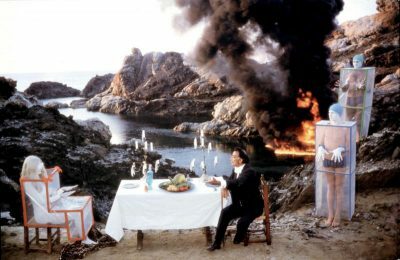 The visit turned into an eight-day project, in which Dalí used Lotte as a source of inspiration for various surrealistic scenes evolved in and around the house, which Bokelberg was only too glad to record. 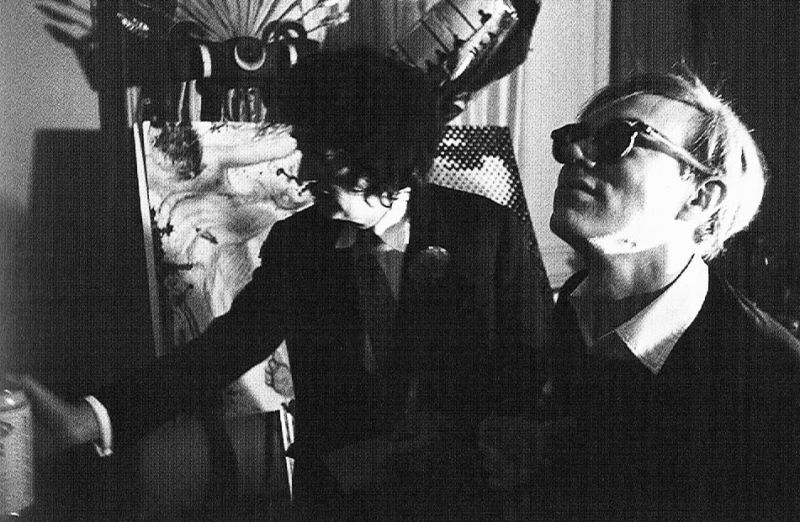 Lotte wore the fashion designer André Courrèges sleek shades for the ocassion. 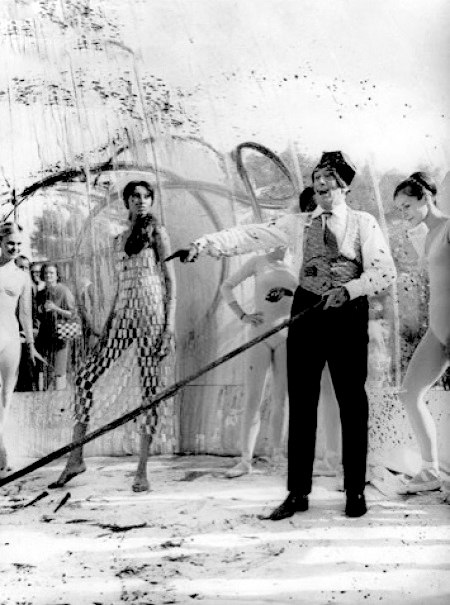 Salvador Dali performance with photographer Peter Beard as both production manager and casting director. The stars of the events in this film are top model Veruschka and Taylor Mead. 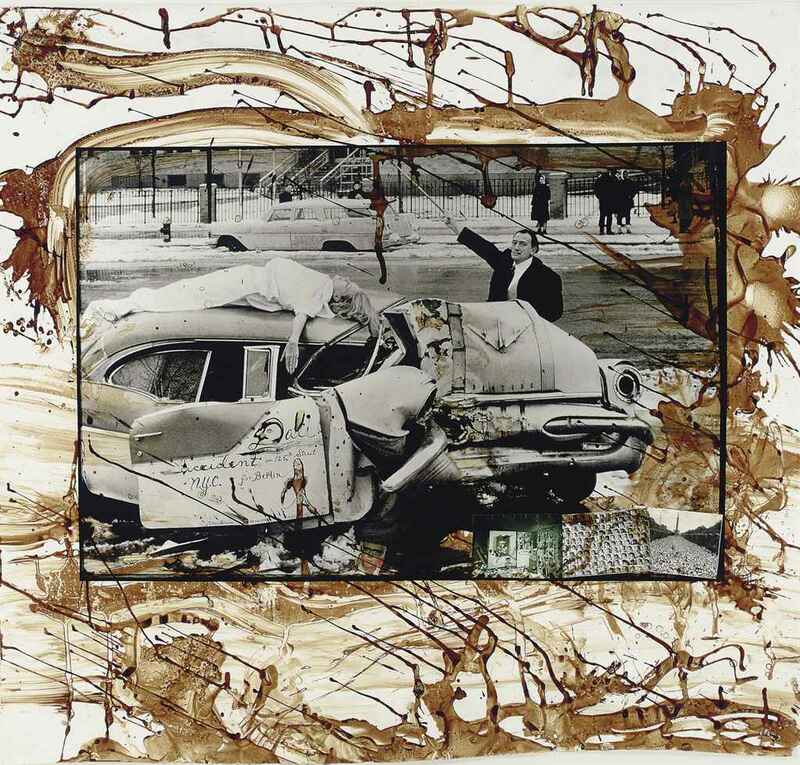 Dalí’s accident on 125th St., NYC , 1963. 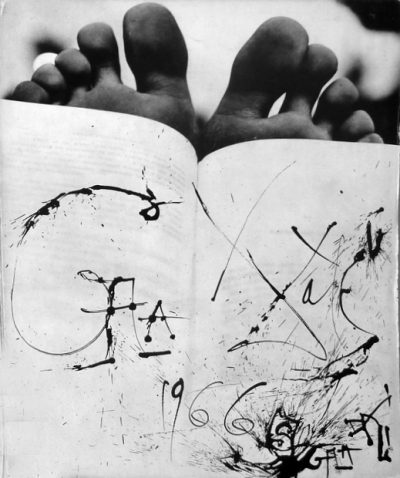 By Peter Beard. 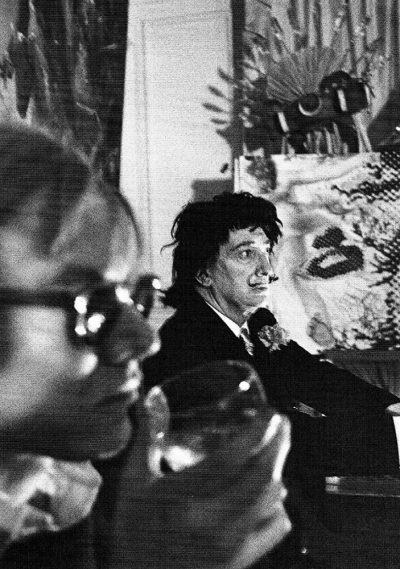 During Andy Warhol’s factory years Dalí beckoned the pop artist into his suite at New York’s St. Regis Hotel (always room 1610) with a theatrical swirl of his cane. Opera was playing at a deafening volume, Warhol was so nervous he was “guzzling back wine,” according to photographer David McCabe who was there to document the meeting. 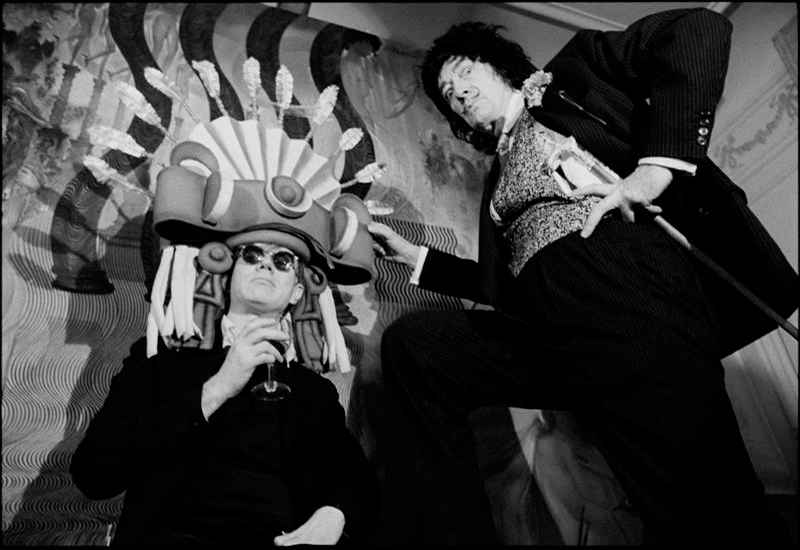 On a subsequent visit, Dalí would tie Warhol to a spinning board and pour paint over him. 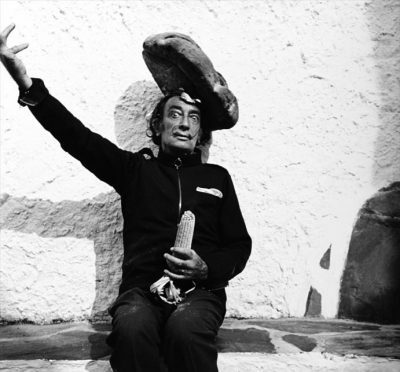 Photographer Jean Clemmer mustered the courage to present himself at Dali’s home without invitation as Dalí accepted unannounced visitors and was rumored to intuitively recognize talent with a glance from his transfixed eyes. Dalí opened the door and instructed Clemmer to arrive at noon the following day with a beautiful girl. 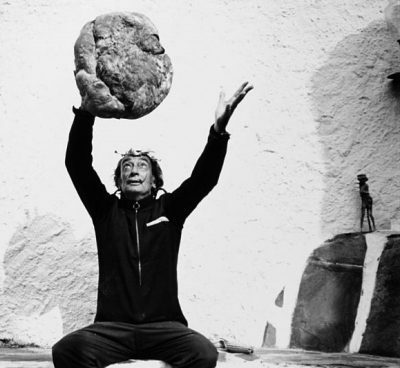 Dalí had model Ginesta suspended upside-down, dangling from a balcony while pouring 80 kilos of chickpeas that would bounce around her, simulating atomic repulsion. 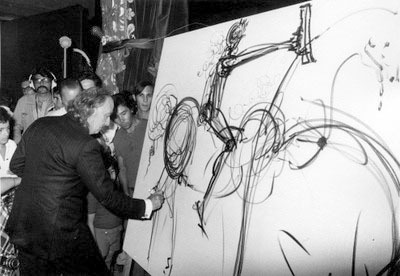 The performances and get together hosted by Dalí rivaled those of Andy Warhol’s “Factory”, by way of profligacy and excess. 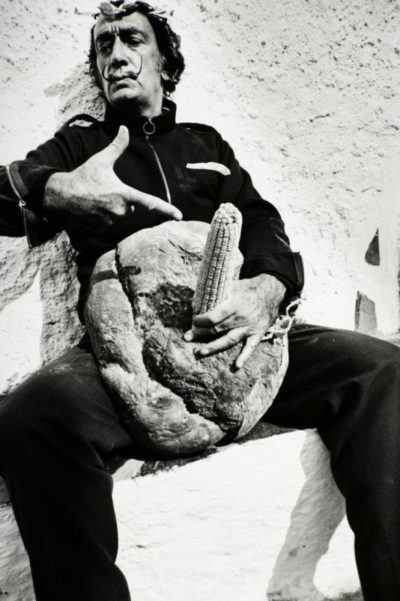 A big part of Dalí work focused on continuing the archetypal tradition of the gods and goddesses of classical Greece would celebrate an unrestrained lifestyle that revived the pre-Christian era in all its Bacchanalian splendor, with irreverent Rock ‘n Roll music serving as the soundtrack. 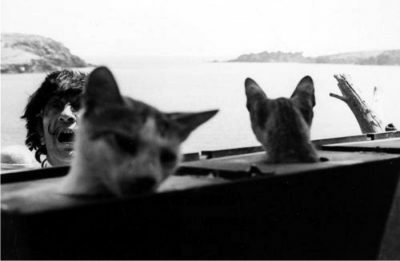 Tuna Fishing in work in progress, 1966-67. Dali spent two whole summers, 1966 and 1967, to paint Tuna Fishing, a work full of dionysian figures. He combined all the styles he had worked in: Surrealism, “refined pompierism”, pointillism, action painting, tachism, geometrical abstraction, pop art, and psychedelic art. 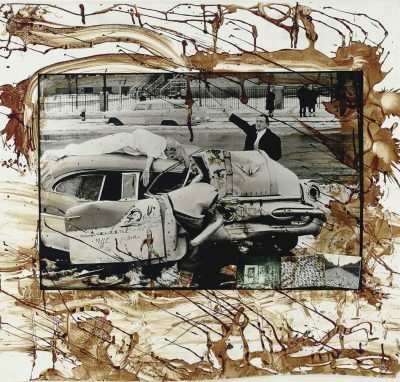 The painting has proved as significant as his 1931 soft watch masterpieces The persistence of Memory . 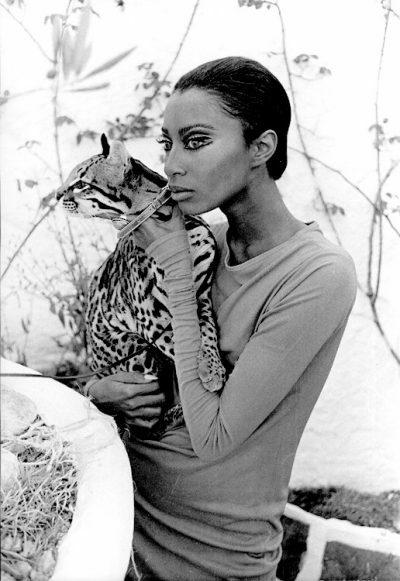 First African-American top model Donyale Luna had a yearning for artistic experimentation. 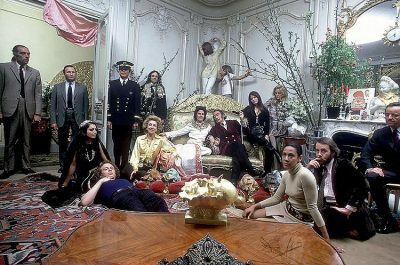 In New York she spent time hanging out with Miles Davis and being painted by psychedelic artist Mati Klarwein, who made record covers for Miles Davis, Santana and Jimi Hendrix. 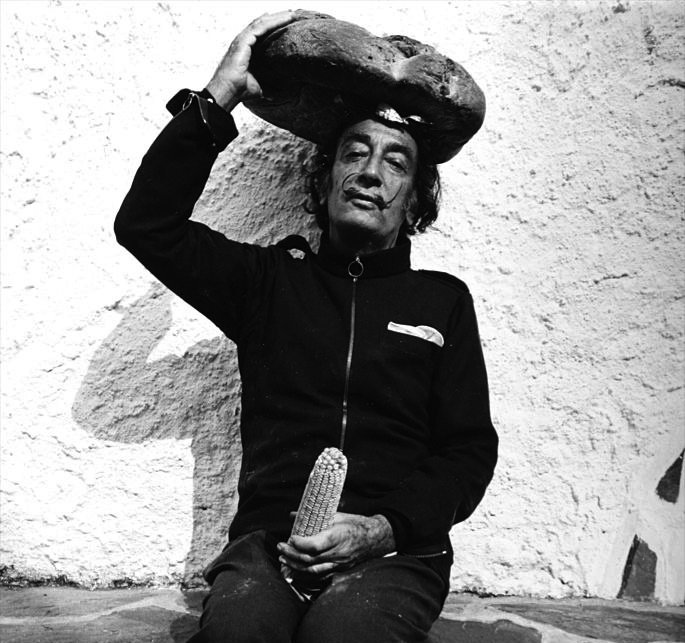 It was fashion photographer William Claxton who introduced her to Salvador Dalí. Luna’s rare beauty and kookiness interested the maestro who considered her one of his favorite models and declared Luna the ‘the reincarnation of Nefertiti’. Donyale Luna modeling a dress decorated by Salvador Dali. 1966. 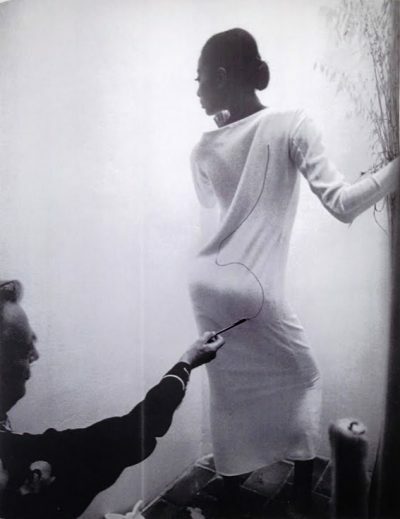 The artist drew a pattern onto the dress as Donyale modeled it. 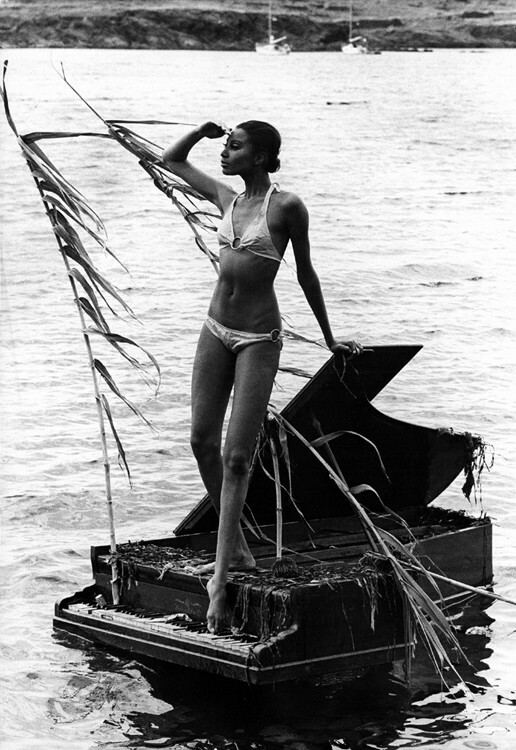 In her first meeting with the Spanish Luna posed in a bikini in the beach outside Dali’s home, which had a grand piano in the water she pretended to play with her feet. 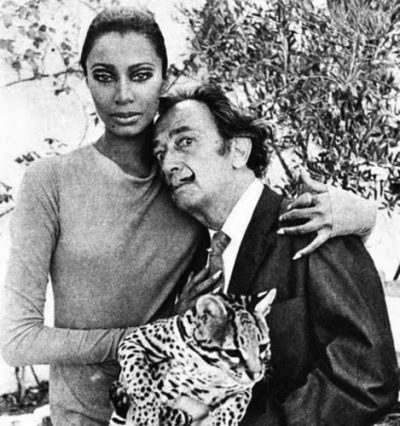 Donyale Luna also featured in the film Soft Self-Portrait of Salvador Dali. 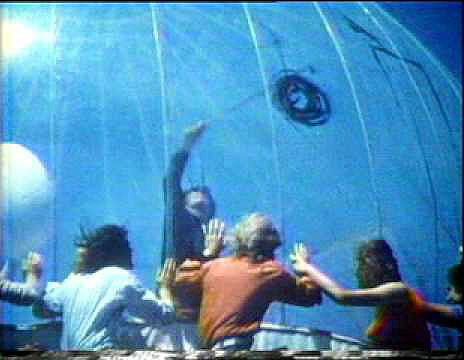 The nearly one-hour 1967 documentary by director Jean-Christophe Averty narrated by Orson Welles was shot on location at Dalí’s home in the seaside village of Port Lligat, outside the small Spanish town Cadaqués, along the Costa Brava in northern Spain. 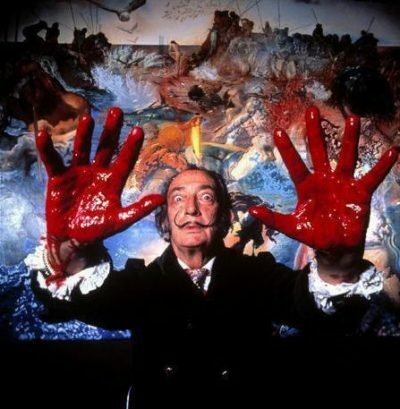 It’s probably one of the more informative documentaries on Salvador Dali life. 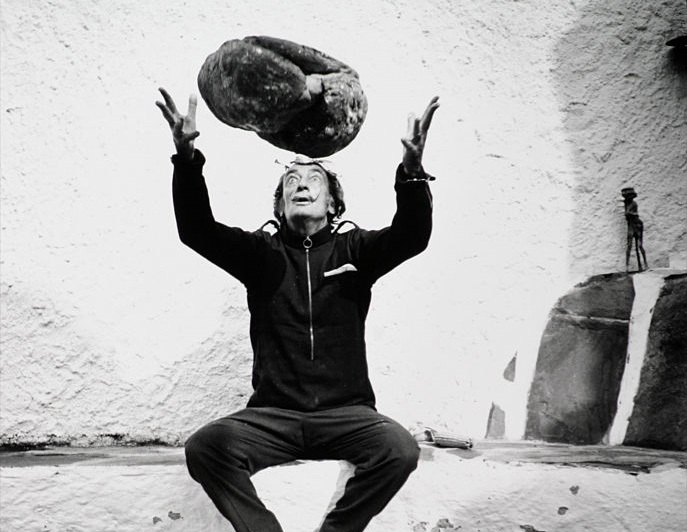 The film is also very much like a tour of the creative process that was behind his remarkable body of work. 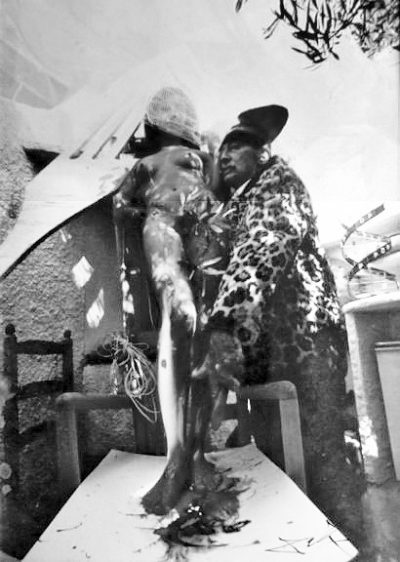 Welles offers up details of Dalí s emergence as an artist in the 1920s, and his important contributions to Surrealism in the 1930s, all the way up into the present day, in the 1960s. 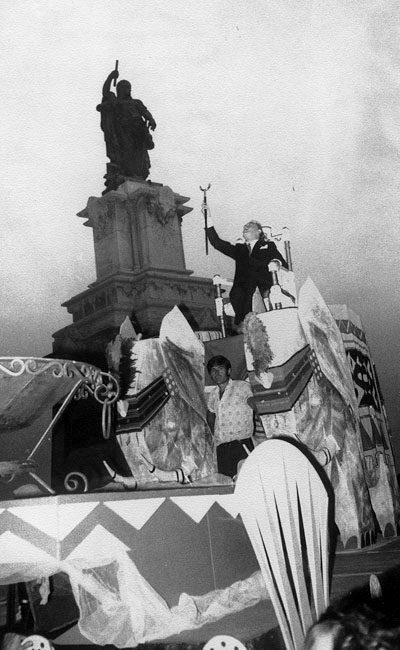 In August 1973, Dalí made a performance as Emperor of Surrealism comparing himself with the Roman emperor Octavio Augustus. 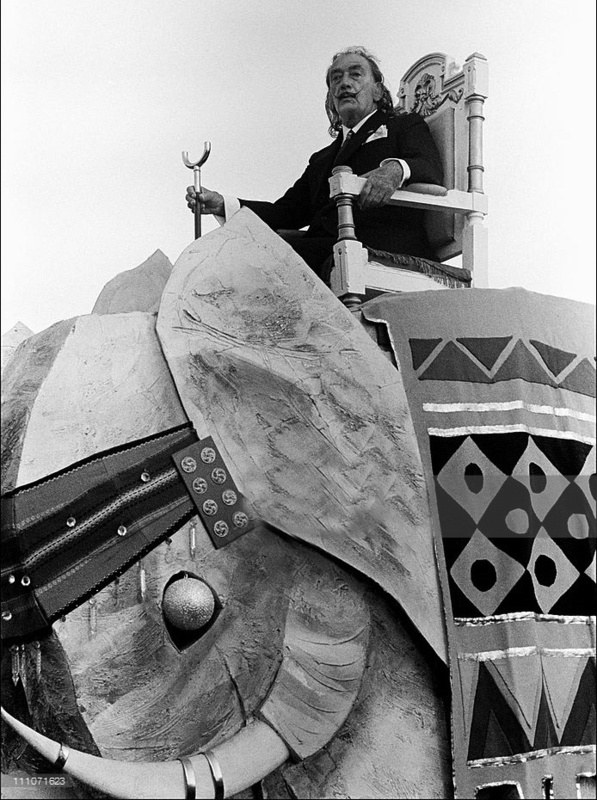 Salvador Dali intention was to visit the city of Tarragona in four elephants from a French circus, but the animals could not clear customs. His solution was to use the cardboard elephant used for Christmas kings’ Day parade.